Tom (Chic) attended Lloyd George Elementary School, and Kamloops Jr-Sr High School, completing his early studies in June 1942. While Tom wished to join the Air Force, he bowed to his mother’s wishes and enrolled in Sr Matric, majoring in Air Cadets (1942-43). During holidays, Tom could be found helping out in his father’s hardware store (Wilcox-Hall). In August 1943, Tom joined the Air Force, serving until March 1945, when he received a medical discharge. 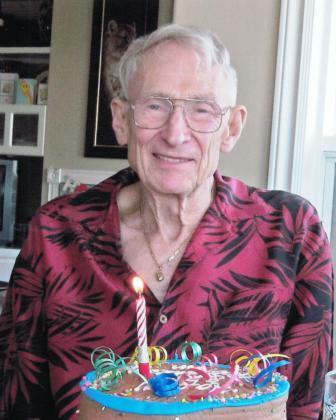 Returning to British Columbia, Tom attended UBC from 1945 to 1950, graduating with a BA and a teaching certificate. His 26-years as a teacher and school administrator started as Principal of the Clearwater Superior School. He then moved on to teach in Powell River, where he had previously worked as a university student for the Powell River Pulp and Paper Company. Tom then moved closer to civilization spending 2 years in Port Moody and where he first met his future wife, Betty (Smith). After marrying in 1953, Tom returned with Betty to Kamloops, where he obtained a teaching position at the new Kamloops High School. After six years there, Tom moved to be vice-principal at John Peterson Jr-Secondary. In 1961, Tom, with Betty and their son, moved to Chase as principal of the Chase Schools. Their daughter also arrived that first year in Chase. Tom retired from the school system in 1976 at age 52 and enjoyed several hobbies, including building, gardening, wood-turning and skiing. For many years, Tom and family members split time between Celista, BC, and a chalet at Silver Star Mountain Ski Resort. The Campbells had a volunteer job on the mountain organizing the “Ski Partner” program, whose function was to give free guided tours to guests unfamiliar with the ski runs. Through 15 years of involvement with the Ski Partners, Tom met and made friends with skiers from around the world. Special Memories include life on Big Shuswap Lake; fishing trips to Pender Harbour, then later at Quadra Island; hunting for elk and exploring southeastern BC; exploring and travelling in Canada and further afield. Predeceased by: His father, Crichton, his mother Lucy Anne, and his sister, Faye, all of Kamloops, BC. Survived by: Wife, Betty Campbell, Kamloops, BC; son, Crichton Campbell, Lee Creek, BC; daughter-in-law, Julie Ann; grand-son, Tommy; daughter, Kathryn, Ottawa, ON; son-in-law, Gardner Buchanan. A gathering to honour Tom’s memory will take place on Friday, November 4, 2016 at 2:00 p.m. at the Coast Conference Centre, 1250 Rogers Way, Kamloops, BC. Donations in memory of Thomas Campbell to the Intensive Care Unit at Royal Inland Hospital, 311 Columbia Street, Kamloops, BC, V2C 2T1 would be appreciated. We are sad to hear that Tom passed away. Although we have not seen you both for a few years we still think of you as very special friends in our lives. Our friendship goes back many years and we followed each others lives as we moved around BC. Our visits and your Christmas cards were very important. Doreen has known you Betty since you were in Gr 3 at Milner School. We are thinking of you all at this time & sending our sincere sympathy. me to go into being a Chartered Accountant. I pursued my dream and was so ever grateful. I have many fun and happy memories of knowing Mr. Campbell during my years as a student at Chase Secondary School. I remember when he was the principal at all three schools! He was a gentle soul who really understood students, and always wanted the best for them. I am so glad to have know him, and to have last seen him at the Chase Centennial celebrations in 2008. May you cherish the memories of your husband and father.